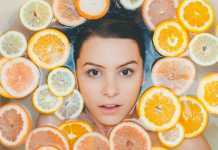 To combat the “orange peel”, a lot of cosmetic products have been invented, and thousands of women wear themselves out because of diets and exercises. However, doctors urge women to learn to take cellulite for granted. According to them, there is no single method that would help get rid of cellulite for those who already have it. If you get desperate when you see your reflection in the mirror and curse yourself for spoiling your own body and allowing cellulite to change it – stop doing it immediately. Doctors call cellulite “a life sentence”: if “orange peel” appears, it should just be considered an integral part of your appearance. Will Weight Loss Rid You of Cellulite? The biggest misconception is to assume that slimming helps to get rid of cellulite. According to scientists, no matter how tough the diet is, it will not lead to getting rid of cellulite. The ways to lose weight through surgery and narrowing the stomach or taking drugs are also ineffective in this respect. A series of experiments conducted by British experts showed that weight reduction led to a different result, making cellulite even more visible than before. Experts say that skin condition is the reason why weight loss cannot cope with cellulite. After losing weight, the skin loses its elasticity and cannot return to its former flat and smooth shape. According to the research conducted by the British scientists, only a very small proportion of women can reduce their “orange peel” with the help of weight loss, but it will not disappear completely. All bumps and pits remained in their places in these women after they had got rid of extra pounds: weight loss could smooth out their relief just a bit. Commenting on the attempts to get rid of the “orange peel”, Douglas McGeorge, a member of the British Association of Aesthetic Plastic Surgeons, was categorical. According to him, you just have to learn to live with it. Yet not a single method has been invented to cure cellulite forever. Buying Guide: Traditional Moroccan Azilal Rugs- How To Get One?